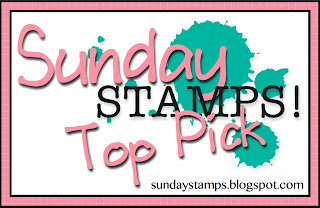 Sunday Stamps... Weekly Challenge: SSC93 Top Picks! Wow, what a great turnout for our Color Challenge last week... So many great projects!! A Huge Thank you to everyone for joining us! What a surprise! As I was checking the new challenge I came across the Top Pick and my card was picked. Thank you so much Annette! !